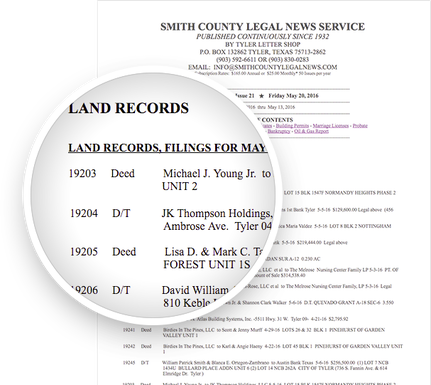 Get a weekly list of forcible detainers (suit for eviction) filed in Smith County, perfect for property management companies, apartment complexes, real estate investors, and landlords. ​This is a great tool for screening tenant applicants. The filings are published in most cases before the Notice of Eviction has been served and always before the court date, giving the leasing company or landlord a “heads up” on tenants who are in violation of their lease agreement, either through non payment of rent or other breach of lease. Property Managers and Landlords in and around the Tyler area have used the filings for Forcible Detainer to alert them of a future potential problem. Up-to-date filings provide the manager/ landlord with names, addresses and in some cases date of birth of the tenant/occupants, who in many cases may be moving out of one apartment unit or home into another. These lists are helpful to the landlord who may look at current and archived issues to search a new applicants name. The newsletter can be used to see if there is a forcible detainer that has been filed or an abstract of judgment for damages with a prior landlord. Easy and effective.